HMS Nelson. Note the small rangefinder on the right and the 4.7"/40 (12 cm) AA gun on the left. A more powerful weapon than the previous 6" (15.2 cm) Mark XII, this gun was originally designed for the never-built "G3" battlecruisers. When those ships were canceled as a result of the Washington Naval Limitation Treaty, the guns and mountings were then used on the Nelson class battleships. These were the first British battleships to carry their secondary armament in turrets rather than in broadside casemates. Like many British medium-caliber mountings of the 1920s, these guns had a high maximum elevation so that they could engage aircraft, but this was of secondary importance to their use in the anti-ship role. In reality, the training and elevation speeds of the mountings were too slow for the AA role. The arrangement on the Nelson class had a major disadvantage in that all turrets and their working spaces were grouped tightly together. As the turrets and working spaces were only lightly protected by 1" (25 mm) HT plating, this meant that a single shell could have disabled all guns on one side. The Mark XXII* was constructed of A tube, taper wound wire, full-length jacket, breech ring and breech bush screwed into the A tube. Used a hand-operated Welin breech block. When this gun was relined with a tapered inner A tube having three locating shoulders, it became the Mark XXII. The later Mark XXII** was built without wire and used an inner A tube. A total of 40 guns were built, including two experimental guns and six Mark XXII**. ^The original design requirement was for a rate of fire of 7 to 8 rounds per minute. On trials, the best rate achieved was 4 rounds per minute. During her battle with Bismarck, Rodney fired 150 salvos from her starboard battery at an average of 5 salvos per minute and 98 salvos from her port battery at an average of 3.9 salvos per minute. During the first 9 minutes at close range she achieved 5.9 rounds per minute and an output of nearly 100%. In all, Rodney fired 716 rounds of 6" (15.2 cm) CPBC during this action. ^As of 1942, the same projectiles as used for the Mark XXIII were issued for these guns. ^The propellant was in a single bag. Flashless does not seem to have been issued. ^3.13.2In addition, there were 72 smoke shells provided per ship. ^Maximum ammunition stowage consisted of 135 CPBC, 15 HE and 24 practice rounds per gun. Telescopic power rammers were used, but the firing cycle was much slower than in earlier mountings. These mountings had very through flash precautions, which may have contributed to the slower ROF. 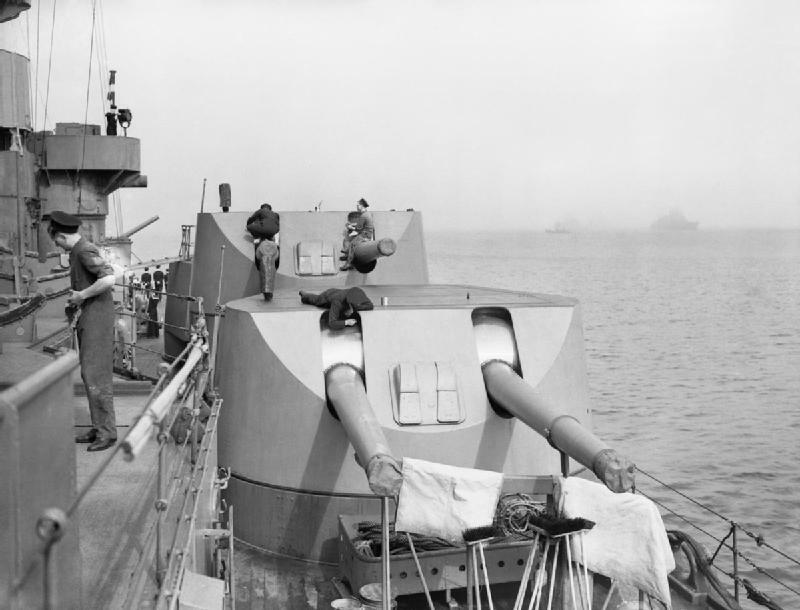 However, the use of turrets meant that much of the ammunition supply could be automated, thus reducing crew fatigue, and they had better arcs of fire both in both the horizontal and vertical planes. As they were mounted on the weather deck, this also meant that they were drier and could function even in heavy seas that would wash out the broadside mounts of earlier designs. The ammunition supply for these mountings was somewhat clumsy. There was a lower magazine with one handling room. 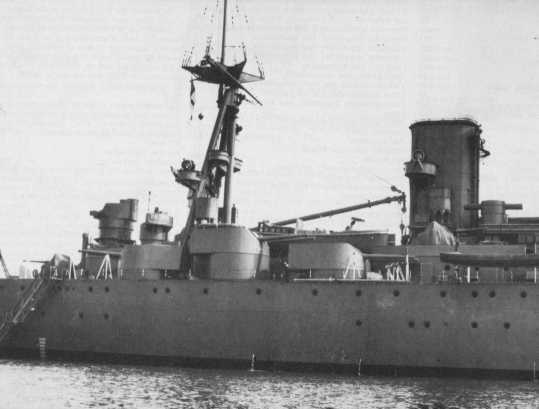 Two hoists supplied the working spaces of P1 and S1 turrets (the forward ones on each side), while an upper magazine with two handling rooms and four hoists supplied the working spaces of the other four turrets. The shell room was above the lower magazine and was equipped with six hoists. The charge hoists were endless chains while the shell hoists were of a pusher type, all of which were electrically powered. The upper hoists from the handling rooms to the turrets were hydraulically powered. There was one charge and one shell hoist per gun. Charges were stored in Clarkson's cases and went up the hoist in them and not removed until just before loading. The cases were returned to the working chamber via a tube and then to the magazines by the down side of the lower hoists and through flashtight scuttles. In the case of the secondary armament, although the rate of fire is rather low, the increased range at which fire can be opened, and the absence of loss of output due to fatigue, combined with excellent ammunition supply arrangements, will be a very pronounced factor in war. In view of the modern tendency of construction for 'all or nothing' armour protection leaving controls and secondary batteries unprotected, the possibility for using the secondary battery for 'harassing fire' at the main armoured target when the range has been found assumes greater importance, and in Nelson the secondary armament can do this efficiently without loss of anti-torpedo boat efficiency. ^1.11.2Turrets were powered by a 60 bhp electric motor driving a hydraulic pump. A single swashplate engine was used for training while elevation was apparently by a swashplate engine turning a worm gear. 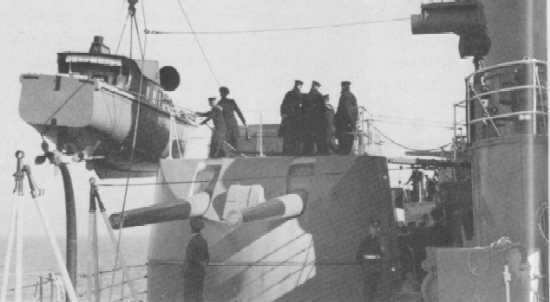 P3 Turret on HMS Nelson in 1932. RAF Museum Photograph. Port 6"/50 (15.2 cm) turrets on HMS Rodney in 1940. IWM photograph A 95. 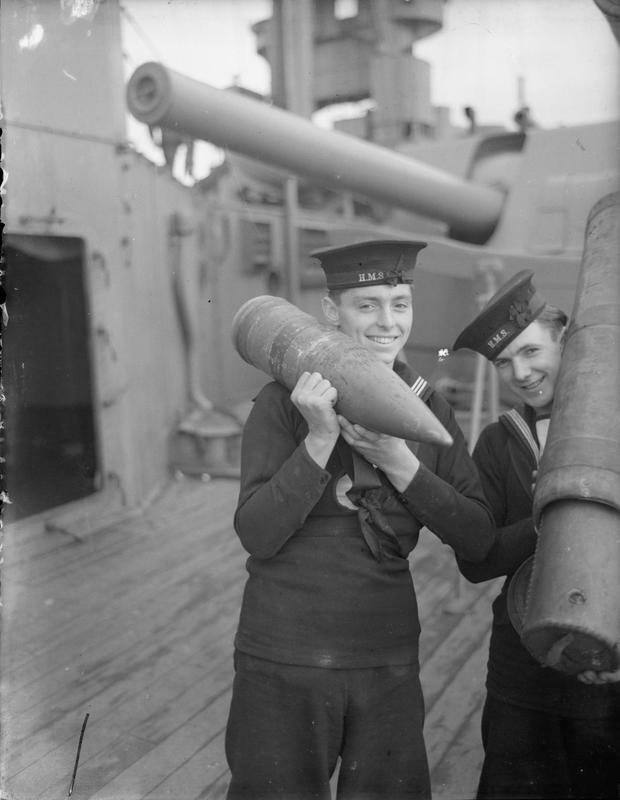 6" (15.2 cm) projectile and propellant container on HMS Rodney. IWM photograph A 1141. 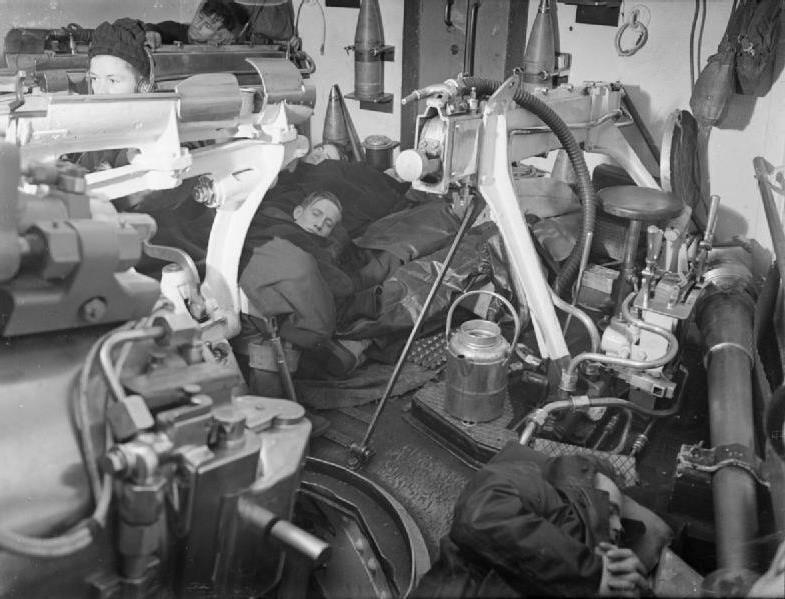 Interior of a Mark XVIII turret on HMS Rodney. Note the ready ammunition clipped to the walls and the power rammer, an unusual feature for British 6" (15.2 cm) guns. 16 men worked and slept in the turret during the war when the ship was at sea. Note the communication number (wearing headphones) remaining awake while his fellows slept. IWM photograph A 2134.